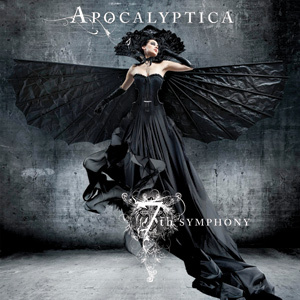 Give credit where it’s due; Apocalyptica have made huge strides in recent years to shrug off the somewhat gimmicky status that being an orchestral Metallica covers band will inevitably afford, and even if 07’s ‘Worlds Collide’ hardly set the universe ablaze, it was a solid and definitive indication that the cello-slapping Finns could finally let their own music do the talking. Though the ofthyped special guest slots don’t carry quite as much star-studded weight this time around with the likes of Corey Taylor, Cristina Scabbia of Lacuna Coil and Rammstein’s Till Lindemann making way for Flyleaf’s Lacey Mosley and Bush crooner Gavin Rossdale, Slayer drummer Dave Lombardo returns to give ‘7th Symphony’ a welcome dose of thrash in instrumental highlight ‘2010’, while Gojira frontman Joe Duplantier puts in a decent slog on token heavy number ‘Bring Them To Light’. It’s all good fun and makes the most of its human components, but there isn’t much here that emerges as truly awe-inspiring or anything else other than a jolly good jam between chums. Of course, if that’s all that’s needed for Apocalyptica to remain among Finland’s most popular imports, then for now, at least, it’s still job done.